Recommended Use: A surface modifier that eliminates the paint peeling problems on automotive plastics. WARNING! Extremely flammable liquid and vapor. May cause an allergic skin reaction. Causes eye irritation. Keep out of reach of children. Read label before use. Keep away from heat/sparks/open flames/hot surfaces - No smoking. Pressurized container - Do not pierce or burn, even after use. Store in a well ventilated place. Keep container tightly closed. Protect from sunlight. Store in a well ventilated place. Eye Contact: Nasal and respiratory irritation, dizziness, headache, nausea, possible unconsciousness, and asphyxiation. Skin Absorption: Moderate irritation, redness, blurred vision. Inhalation: Dizziness, breathing difficulty, headaches, and loss of coordination. Ingestion: Gastrointestinal irritation, vomiting, diarrhea. Eye Contact: Immediately flush eyes with excess water for 15 minutes, lifting lower and upper eyelids occasionally. Skin Contact: Immediately flush skin with excess water for 15 minutes removing contaminated clothing. Inhalation: Remove to fresh air. If not breathing, give artificial respiration. Ingestion: Call Poison Control immediately. Aspiration hazard. Rinse mouth with cold water. Give victim 1-2 tbsp of activated charcoal mixed with 8 oz. of water. Medical Conditions Aggravated by Exposure: Bronchitis, CNS disorders, allergies, nausea. Fire Fighting Procedures: Respiratory equipment should be worn to avoid inhalation of concentrated vapors. Water should not be used except as a fog to keep nearby containers cool. Unusual Fire and Explosion Hazards: Handle as a flammable liquid. Vapors form an explosive mixture in air between the lower and upper explosive limits which can be ignited by many sources such as pilot lights, open flames, electric motors and switches. Steps to be Taken if Material is Released or Spilled: Remove all sources of ignition. Allow volatile portion to evaporate completely. Avoid breathing vapors and remove with inert absorbent. Personal Precautions: Use personal protection recommended in Section 8. Isolate the hazard area and deny entry to unnecessary and unprotected personnel. Remove all ignition sources and ventilate area. General Handling: Reports have associated repeated and prolonged occupational overexposure to solvents with permanent brain and nervous system damage. Intentional misuse by deliberately concentrating and inhaling the contents may be harmful or fatal. Avoid spontaneouscombustion of contaminated rags or other ignitable material. Keep out of reach of children. Other Precautions: Use with adequate ventilation and do not breathe dust or vapor. Avoid contact with skin, eyes, or clothing. Wash hands thoroughly after handling. Storage: Do not store near heat, sparks or flame. Store in well ventilated area. Keep closure tight and container upright to prevent leakage. Do not puncture or incinerate. Do not spray near fire or open flames. Eye/Face Protection: Goggles or side-shielded safety glasses. Skin Protection: Neoprene or butyl rubber gloves. Respiratory Protection: Use of a NIOSH approved chemical/mechanical filter, designed to remove a combination of particles and vapors. Hygenic Measures: Wash hands before eating, smoking or using the washroom. Other Protection Measures: To prevent repeated or prolonged skin contact, wear impervious clothing and boots. Wash contaminated clothing before reuse. Conditions To Avoid: Excessive heat, poor ventilation, open flames, sources of sparks. Incompatible Materials: Alkaline materials, strong acids, and oxidizing materials. 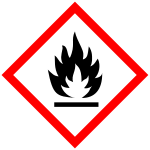 Hazardous Decomposition Products: Carbon monoxide, carbon dioxide, various hydrocarbons, oxides of nitrogen, chlorine and possibly acrolein. 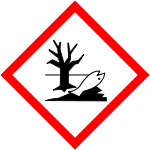 Toxic to terrestrial and aquatic plants and animals. Do not release to the environment. Do not incinerate. Dispose of in accordance with local, state and federal regulations. Do not contaminate lakes, streams or other water supply. Container Disposal: Disposal must be made according to official regulations. 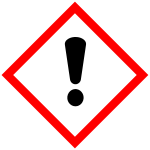 The following table list hazardous components and the regulatory lists for which they are required to be reported. Xylene is listed with Pennsylvania Right to Know. Xylene is listed with Massachusetts Right to Know. Xylene is listed with Rhode Island Right to Know. Xylene is listed with Illinois toxic substances discloure to employee act. Xylene is listed with New Jersey Right to Know. Xylene is listed with Minnesota Right to Know. Ethyl Benzene is known to the State of California to cause cancer. Ethyl Benzene is listed with Pennsylvania Right to Know. Ethyl Benzene is listed with Massachusetts Right to Know. Ethyl Benzene is listed with New Jersey Right to Know. Ethyl Benzene is listed with Minnesota Right to Know. Acetone is known to the State of California to cause cancer. Acetone is listed with Pennsylvania Right to Know. Acetone is listed with Massachusetts Right to Know. Acetone is listed with New Jersey Right to Know. Acetone is listed with Minnesota Right to Know. Tertiary Butyl Acetate is listed with Pennsylvania Right to Know. Tertiary Butyl Acetate is listed with Massachusetts Right to Know. Tertiary Butyl Acetate is listed with Rhode Island Right to Know. Tertiary Butyl Acetate is listed with New Jersey Right to Know. This Safety Data Sheet (SDS) is prepared in compliance with GHS Hazcom 2012. The information may be based in part on information provided by component suppliers and is believed to be correct as of the date hereof. However, no warranty or merchantability, fitness for any use, or any other warranty is expressed or is to be implied regarding the accuracy of of this data, the results to be obtained from the use of the material, or the hazards connected with such use. Since the information contained herein my be applied under conditions beyond our control and with which we may be unfamiliar, and since data made available subsequent to the date hereof may suggest modification of the information, we assume no responsibility for the result of its use. This information and material is furnished on the condition that the person receiving it shall make his/her own determination as the the suitability of the material for his/her particular purpose and on the condition that he/she assume the risk of his/her use thereof.